The Nicole Lee Noelle 3PC Set gives you the options for your every mood, big? Small? Hands free? You choose! 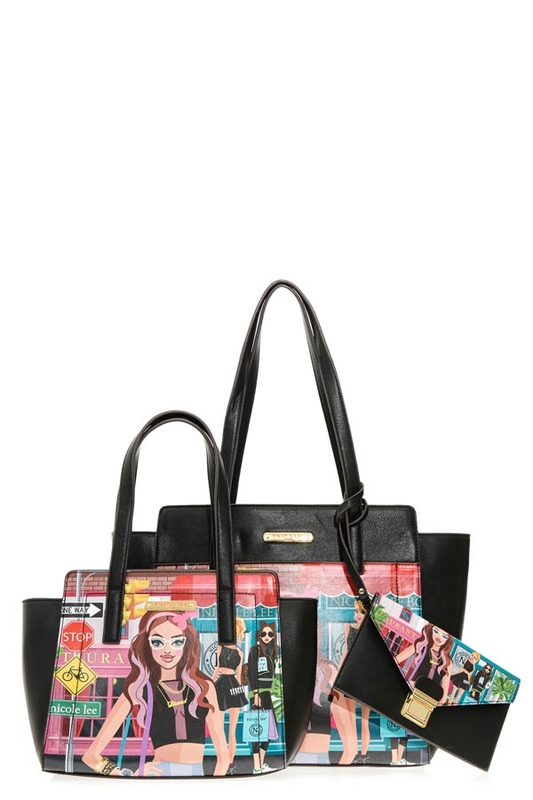 Exterior Features: This 3pc set comes with a large satchel bag, small handbag, and wristlet. Made of vegan leather with exclusive NL print. Handbags feature: metal zipper closure. Dual top handles, Zip wall pocket at back and Structured silhouette with NL nameplate at front. Wristlet features: Flap top with push lock closure and vegan leather wristlet strap. Interior Features: Handbags feature: main compartment, zip wall pocket with NL nameplate at back, double open wall pockets at front, vegan leather key chain strap (only on big bag) and NL polka dot logo nylon lining. Wristelet features: Suede interior. Vegan leather handles with 9.5" inch drop (Satchel bag), 6.5" inch drop (Small handbag), Wristlet 8" inch drop.